This 3500 sq ft Hampton's styled home has a large light filled living room with fireplace and sliding glass doors to the expansive deck with heated pool. The open floor plan makes this home perfect for entertaining. This home is situated on .75 of an acre of property that backs up to a private horse farm. The backyard is fenced and has a 1200 sq ft expansive deck with heated pool. The yard is sunny all day as it faces west and has the breath taking sunset. The property is surrounded by fields and woods and is very private. There is a custom chef's kitchen with farm style sink, 2 dishwashers and breakfast area. The main level has a spacious master bedroom and bath with 2 additional guest bedrooms and 1 additional bathroom. Second level has addition Junior suite with dedicated bathroom and 2 additional bedrooms and bathrooms. This property is convenient to shopping, parks, wineries and ocean beaches. 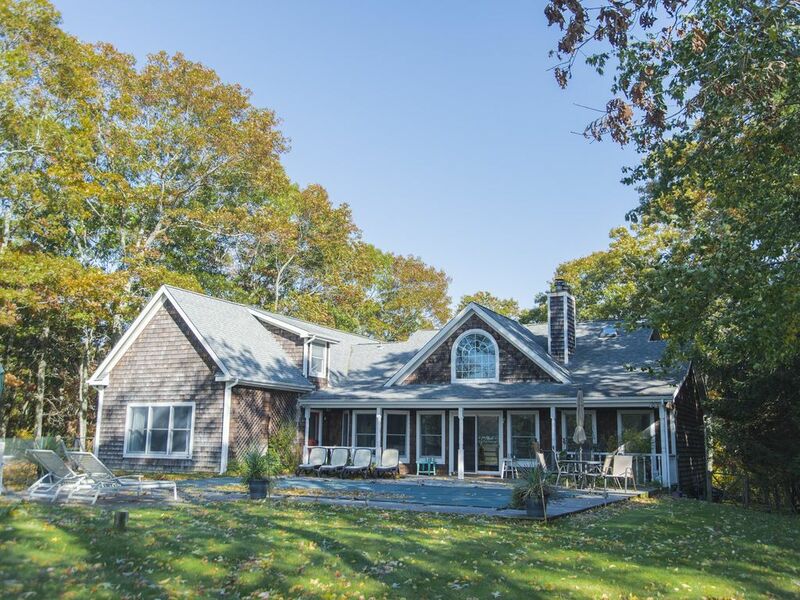 Staying in Water Mill give you access to both Bridgehampton & Southampton in just minutes. Enjoy this amazing summer getaway in the Hamptons. I am an Executive for Television Bureau of Advertising in NYC. I live with my wife and two young boys in Brooklyn. I grew up in the Southampton area and love to share its beauty with visitors. I am very committed to providing you the best service available and answer all your question in a timely manner. It really means the world to hear from guests about a great experience they had at the property. large light filled rooms, expansive deck with heated pool, open floor plan perfect for entertaining, property that backs up to a private horse farm, fenced private backyard surrounded by fields and woods, chef's kitchen with farm style sink, 2 dishwashers, convenient to shopping, parks, wineries and ocean beaches, & location gives you access to both Bridgehampton & Southampton in just minutes. large light filled living room with fireplace and sliding glass doors to the expansive deck with heated pool. custom chef's kitchen with farm style sink, 2 dishwashers and breakfast area. Dining table seats 8 with Side board and bar area. While we enjoyed the house and property, it seems clear that they were not ready for us. There were workmen in the house, debris outside, and the house required dusting and vacuuming -- which we provided. We understand this was off season, but not quite what we would have expected. But again, our overall experience was favorable. Girls Weekend (Bachelorette) Great Place to Stay! We came to the Hamptons for a bachelorette party- the house was beautiful and spacious and very comfortable for everyone. The pool was also beautiful and we enjoyed lounging on the patio. Michael provided great customer service as he was extremely responsive to all questions and also provided great recommendations for places to eat in the surrounding area. I would definitely recommend this house and hope to be back in the future!! We have been going to the Hamptons for years, first as a couple and now as a family. We wanted to rent a place that was big enough for our family and our friends, that had a pool and had modern amenities. This house fit the bill and we will definitely be renting it again. The house is very nice and has a lot of rooms. Has a pool table in the basement. Would definitely stay again. This was a wonderful trip, everything about our stay was incredible. The price for the house and the location was phenomenal. As soon as you open the door the house gives off a welcoming feeling with it's numerous bedrooms and a hangout room with a billiard table in the basement. Also the view with horses galloping in the distance was amicable. The owner Mike was a pleasure with his very quick responses. I immensely recommend staying here, I know I will. Property is just minutes from many Bridgehampton, Water Mill & Southampton Restaurants, bars, beaches, movie theaters & shopping. Boating, paddle board, jet skiing, kayaking and other water sports are close by to rent or take lessons. All Rates including Damage Deposit are subject to change until reservation is confirmed. No Smoking, Pets Considered on a case by case basis. Renters responsible for weekly cleaning service and utility usage and maintenance.